In this electronic circuit project Open door alarm a very simple 555 timer Open door alarm circuit project can be designed using an linear hall effect device like in this circuit diagram. This 555 timer Open door alarm circuit is based on the TL3103 linear Hall Effect device used for detecting the angle of rotation. The TL3103s are centered in the gap of a U-shaped permanent magnet. This type of circuit can sense the opening of a refrigerator door. When the door opens, a triac could be activated to control the inside light. The figure shows a door position alarm. When the door is opened, an LED turns on and the piezo alarm sounds for approximately 5 seconds. 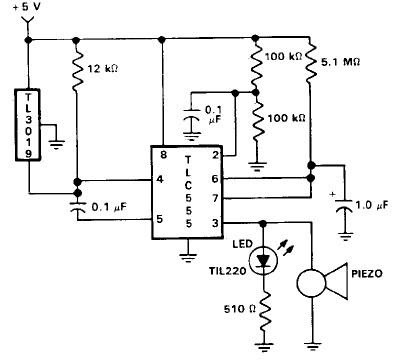 This door alarm electronic circuit uses a TL3019 Hall Effect device for the door sensor. This normally open switch is located in the door frame. The magnet is mounted in the door. When the door is in the closed position, the TL3019 output goes to logic low, and remains low until the door is opened. Usually a 555 timer circuit is triggered by taking the trigger, pin 2, low which produces a high at the output, pin 3. In this configuration with the door in the closed position, the TL3019 output is held low. The trigger, pin 2, is connected to Vi the supply voltage Vcc .When the door opens, a positive high pulse is applied to control pin 5 through a 0.1 uF capacitor and also to reset pin 4. This starts the timing cycle. Both the piezo alarm and the LED visual indicator are activated. This door alarm electronic circuit project must be powered from a 5 volt DC power supply . The TL3019 hall effect device can be replaced with A3121EUA hall effect device manufactured by Alegro Microsystems and the 555 timer from any manufacturer should be working fine.